Hypocapnia induces cerebral vasoconstriction leading to a decrease in cerebral blood flow, which might precipitate cerebral ischemia. Hypocapnia can be intentional to treat intracranial hypertension or unintentional due to a spontaneous hyperventilation (SHV). SHV is frequent after subarachnoid hemorrhage. However, it is understudied in patients with severe traumatic brain injury (TBI). The objective of this study was to describe the incidence and consequences on outcome of SHV after severe TBI. We conducted a retrospective, observational study including all intubated TBI patients admitted in the trauma center and still comatose 24 h after the withdrawal of sedation. SHV was defined by the presence of at least one arterial blood gas (ABG) with both PaCO2 < 35 mmHg and pH > 7.45. 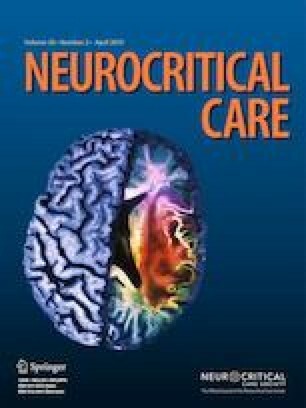 Patient characteristics and outcome were extracted from a prospective registry of all intubated TBI admitted in the intensive care unit. ABG results were retrieved from patient files. A multivariable logistic regression model was developed to determine factors independently associated with unfavorable outcome (defined as a Glasgow Outcome Scale between 1 and 3) at 6-month follow-up. During 7 years, 110 patients fully respecting inclusion criteria were included. The overall incidence of SHV was 69.1% (95% CI [59.9–77]). Patients with SHV were more severely injured (median head AIS score (5 [4–5] vs. 4 [4–5]; p = 0.016)) and exhibited an elevated morbidity during their stay. The proportion of patients with an unfavorable functional neurologic outcome was significantly higher in patients with SHV: 40 (52.6%) versus 6 (17.6%), p = 0.0006. After adjusting for confounders, SHV remains an independent factor associated with unfavorable outcome at the 6-month follow-up (OR 4.1; 95% CI [1.2–14.4]). SHV is common in patients with a persistent coma after a severe TBI (overall rate: 69%) and was independently associated with unfavorable outcome at 6-month follow-up. The online version of this article ( https://doi.org/10.1007/s12028-018-0639-0) contains supplementary material, which is available to authorized users. PE, JR, and CJ contributed to the study concept and design. PE, JR, MC, ED, AM, PJC, and AS contributed to the acquisition of data. PE, PG, AD, and BP contributed to the analysis and interpretation of data. PE, PG, JB, and EM contributed to the drafting of manuscript and critical revision of the manuscript for important intellectual content. All authors read and approved the final manuscript. Institutional Review Board of the Sainte Anne Military Hospital, Toulon (France), approved the study and waived the requirement for informed consent from the patients or patient’s kin given the observational nature of the study.